The future of healthcare lies in the quality of its people. What can you do to identify, acquire, develop and retain employees with new skills that are required to succeed in a new model of reimbursement on outcomes, not fee for service. High-performing talent is the solution to the rising costs and challenges facing the healthcare industry. Organizations that take a disciplined approach to growing talent with new competencies will improve patient outcomes, drive revenues and reimbursements, and succeed in the future. In this e-book, we break down six steps you can take to drive great patient experience through your people. 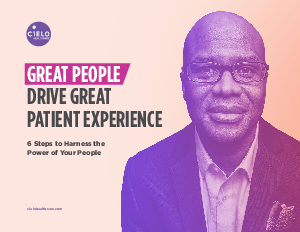 Download our e-book “Great People Drive Great Patient Experience” to see what you can do to develop your people, improve patient outcomes, drive revenues and reimbursement, and succeed in the future of healthcare.